William K. Rogers, Duluth’s original park board president and the man who first envisioned today’s Skyline Parkway, was also an investor in the Highland Improvement Company, which developed the Duluth Heights neighborhood. The company, whose investors included former U.S. president Rutherford B. Hayes, controlled over one thousand acres of land along today’s Skyline Parkway adjacent to Duluth’s downtown business district. The company had grand plans for this choice property, which it would develop into the first phase of the Duluth Heights neighborhood. skillful landscape artists and topographical engineers have platted [Duluth Heights] to conform with nature’s suggestions and realize the most pleasing effects. Streets and avenues will wind about in delightful disregard of the points of the compass, and the lots and blocks upon which elegant houses are to be built will be of a size and shape which aid in giving to each home a distinctive yet harmonious individuality. 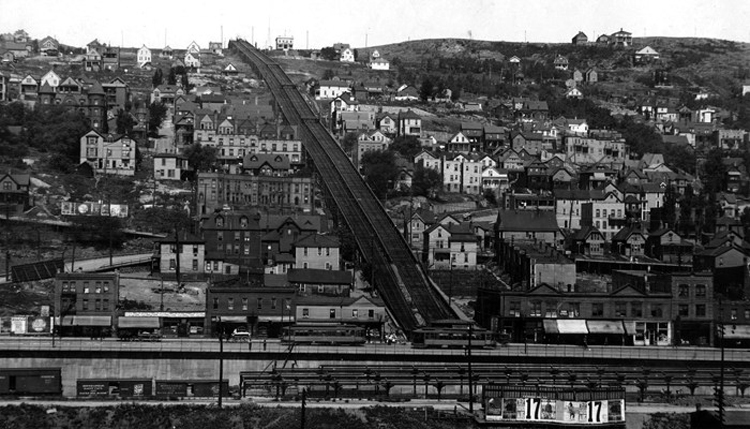 To provide the future citizens of Duluth Heights access to their hilltop property, the company constructed an incline, or funicular, railway running from Superior Street five hundred feet up the hillside along Seventh Avenue West to the top of what was called Beacon Hill. Beyond that, they built the Highland Park Tramway, a short-line streetcar system to serve Duluth Heights. The incline allowed those living in Duluth Heights to get to and from downtown, where they could transfer to streetcars to reach other portions of the city. Once complete, the Duluth Street Railway Company took over operation of both railways. The Seventh Avenue West Incline consisted of two tracks built into a 2,975-foot superstructure. Two specially designed streetcars, each weighing twenty-nine tons, were pulled along cables by a hoisting engine driven by several four-hundred-horsepower boilers in a powerhouse located at the top of the railway. The cars—which carried both people and horses—were positioned on the track to provide counterbalance: when one car was at the top of the railway, the other was at the bottom. They passed precisely in the middle. The incline opened in October 1891. Among the passengers in the first test ride was Luther Mendenhall, an investor in the Street Railway Company who had recently replaced William K. Rogers as president of the Duluth Board of Park Commissioners. Conductors called out “East car clear!” and “West car clear!” before the cars were engaged in operation. Both going up and coming down, the railway offered spectacular views of downtown, the harbor, Minnesota Point, and (after 1905) the aerial lift bridge. Along Superior Street the company built a small depot. Duluthians immediately embraced the incline, many riding to the top just to enjoy the stunning view. The company decided that a pavilion adjacent to the powerhouse would bring even more people (and potential home owners) to the Heights. Designed by Oliver Traphagen and Francis Fitzpatrick, Duluth’s premier architects at the time, the $20,000 Beacon Hill Pavilion made the top of the incline a destination. The large Shingle-style building measured one hundred by three hundred feet and featured a square tower. Twenty windows across the building’s front façade offered views of the harbor. The Beacon Hill Pavilion, called simply the Incline Pavilion by most, opened in July 1892, just in time to host a huge community Fourth of July celebration that featured $500 worth of fireworks. The street railway company reported that 14,716 passengers rode the incline that day. The pavilion quickly became the most fashionable place in Duluth. Open from May until late autumn, it included restaurants, an amusement center, and the Pavilion Theatre, which sat two-thousand spectators who paid twenty-five cents to see dramatic works and vaudeville acts “suitable for ladies and children as well.” Diners enjoyed the Palm Garden, a restaurant operated by pavilion manager J. L. Travers. Orchestral and military bands provided music for dances, while the grounds were used for picnics and hot air balloon flights by Professor Baldwin, a “daring aeronaut” whose acts included a hot-air balloon. By early 1893 the park board came under pressure to create a public park adjacent to the pavilion. 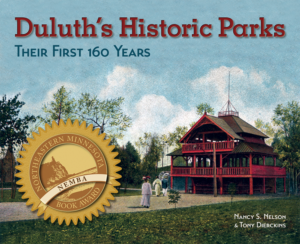 An editorial in the Duluth News Tribune claimed that the spot was “already settled upon by the people as a pleasure and recreation ground, it is already half park…one thousand can pay the 5 cents each to take them to the Pavilion…The Pavilion park would be the rest and breathing spot of the whole city.” The park board responded favorably. In January 1893 members voted to acquire four blocks of land located below the pavilion for a “hilltop park.” Unfortunately, due to the Financial Panic of 1893, the board was so short of money that in August 1893 it stopped all park improvements and laid off all but two men. In June 1895 the board members again resolved to create the hilltop park, but it wasn’t until 1907 that they finally acquired just one of the four parcels—a square block between Sixth and Seventh Avenues West and Eighth and Ninth Streets. Duluthians would have their Hilltop Park, but by then the Beacon Hill Pavilion was already just a memory. On May 28, 1901, a fire had broken out in the incline’s powerhouse and quickly spread to the pavilion. The east car sat just outside the powerhouse while the west car waited at the bottom of the hill. The intense heat of the fire literally melted the rail system’s cables, releasing the flaming east car, sending it racing down toward Superior Street. Luckily the Superior Street station attendants anticipated the situation and did as much as they could to get people, horses, and streetcars out of the way. The car smashed through the station, crossed Superior Street, and came to a halt in the rail yards near the Union Depot. The car was destroyed; amazingly no one was injured. The pavilion, heavily damaged in the fire, was never rebuilt. The incline was hastily reconfigured with just the west car operating and a counterweight taking the place of the east car. An electric engine replaced the steam boilers, but the railway did not receive a proper overhaul and new cars until 1911. The incline returned to two-car operation in 1912. The Seventh Avenue West Incline served Duluth until Labor Day 1939, the last of Duluth’s streetcar system to be dismantled and sold for scrap. The park board never added any more land to Hilltop Park, nor did they make any improvements to the area. After 1939 Hilltop Park was all but forgotten, remaining just a small unmarked parcel of public greenspace on the hillside above Skyline Parkway, seldom visited by anyone other than nearby residents.